When a swimmer needs time for a pause or take a breath, he/she stops and treads water. Treading water is a good metaphor in life when you need to stop and take stock of where you are, rescope and re-evaluate and put a plan of action to move forward. We all need “pauses” in our lives to re-charge and refuel for what’s next. But too much treading, can cause you to spin in place or to sink. I’m a runner. There are days I run fast, and times when it’s just good I got out of bed and my feet are moving. Running is about moving forward. It’s about making progress. And I am NOT a dreadmiller. 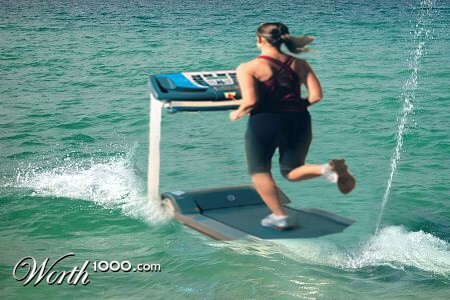 Treadmills are called “tread” mills because you run in place – they are just another form of treading water. The real run is about genuine forward motion. At work and in life, I’ve stopped to tread water and yes, I’ve even run on a “dreadmill” but only when needed — to evaluate my strategy, relationships, and activities (or when the weather is just too unsafe to allow me to run) However I tend to tread just long enough to do the hard work to put a plan together to start running again and move forward. Tread? Spin? No! The world needs you to move forward. Go on ahead! What are you waiting for?